Let's take the $|00\rangle$ state as input. The vector representation of $|00\rangle$ state is $[1 \ 0 \ 0 \ 0]$, but this is the representation of $2$ qubits and H accepts just $1$ qubit, so should we apply the first H gate to $[1 \ 0]$ and the second H gate to $[0 \ 0]$? Or should we input $[1 \ 0]$ in each H gate, because we are applying H gates to just one qubit of state $|0\rangle$ each time? Or should we input $[1 \ 0]$ in each H gate, because we are applying H gates to just qubit of state $|0\rangle$ each time? Yes, when you have a two-qubit state (say you label the two qubits as $A$ and $B$ respectively), you need to apply the two Hadamard gates separately on each qubit's state. The final state will be the tensor product of the two "transformed" single-qubit states. If the two input qubits are entangled, the above method won't work since you won't be able to represent the input state as a tensor product of the states of the two qubits. So, I'm outlining a more general method here. 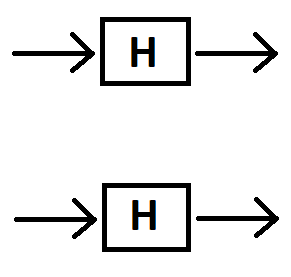 When two gates are in parallel, like in your case, you can consider the tensor product of the two gates and apply that on the 2-qubit state vector. You'll end up with the same result. The tensor product also operates on linear maps between vector spaces. Specifically, given two linear maps $S : V \to X$ and $T : W \to Y$ between vector spaces, the tensor product of the two linear maps $S$ and $T$ is a linear map $(S\otimes T)(v\otimes w) = S(v) \otimes T(w)$ defined by $(S\otimes T)(v\otimes w) = S(v) \otimes T(w)$. We can easily verify that this is a valid quantum state by checking the normalization condition. In general, in this context, it's more intuitive if you use Dirac's bra-ket notation (i.e. use $|00 \rangle$ instead of the column vector $(1, 0, 0, 0)^T$). Then, if you have to apply a gate to a subset of the qubits, you can proceed in an analogous way as I did above. Not the answer you're looking for? Browse other questions tagged quantum-gate quantum-state or ask your own question. How do we physically initialize qubits in a Quantum register?